I've previously seen some excellent movies about the Balkan conflict, so I was apprehensive when, as part of my ongoing research into human rights and film, I chose the English-language film Welcome to Sarajevo (1997). The movie is directed by Michael Winterbottom, and contains some big-name actors: Woody Harrelson and Kerry Fox, who later appeared in the movie Storm (2009), about the International Criminal Tribunal for the former Yugoslavia – and Goran Visnjic, who played Dr Kovač on the TV series ER! The film was inspired by the true story of the British TV news reporter Michael Nicholson, who, after months of reporting on the siege of Sarajevo, smuggled a child out of the city and adopted her. In formal cinematic terms, it's not the best movie you will ever see. However, it does contain some interesting footage filmed at the time of the conflict. The first half of the movie is pretty slow, although it does pick up in the second half. One of the key messages of the film is that the war does not end when it is declared to be over. The consequences of conflict remain, and rebuilding the rule of law and security remains a hard battle. Another issue that the film focuses on is the ethics of journalism: Watchdog or sensationalists? 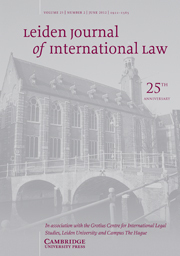 For recent academic work in this field, check out 'Human Rights and the Mediatization of International Law', a 2010 Leiden Journal of International Law article by Dr Daniel Joyce, a Lecturer in Law at Australia's University of New South Wales.